My interest in wildlife arose from a country childhood when I was brought up on a farm in the Cotswolds. 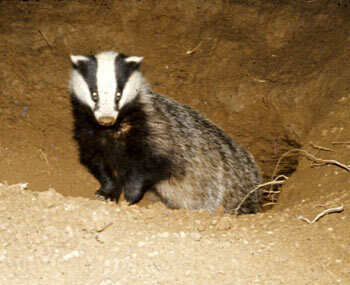 The focus on mammals was sparked by discovering of Ernest Neal's pioneering book - The Badger. Written partly about areas that I knew well it led to many hours spent watching these animals and a fascination with them which continues to this day, more than 40 years later. This badger is one of the first pictures I took with a 'real' camera, on a neighbour's farm. Following a zoology degree at Cambridge University I moved to Exeter to carry out a PhD on mink which quickly led on to a comparative study of the diets of mink and otter and then an involvement with the first national otter surveys in the UK. Chance meetings with people who had collections of old otter hunting records enabled me to fathom out the cause of the otter's decline in collaboration with Don Jefferies. Our paper on this topic, published in 1978, is probably my most significant contribution to the sum of knowledge about otters. Don and I collaborated further on the first two otter surveys of England as well as a survey of pine marten in England with the field work being carried out by Libby Lenton, Johnny Birks and Rob Strachan. By this time I had become a member of the Adult Education Department at Exeter University and much of my time was concerned with organising and teaching courses for the general public in Devon and Cornwall. 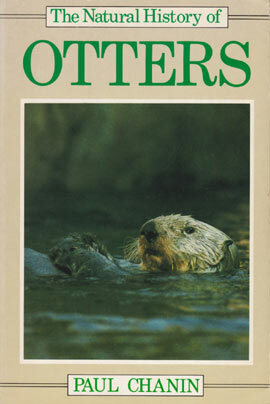 With little time for practical research, I wrote two books on otters, published in 1984 and 1993. Remarkably these are still read today, despite being long out of date. However, a second edition of the Whittet book was published in January 2013. During this time I was able to supervise a small number of research students, working on creatures as diverse as badgers, red deer, spider monkeys and the prey of Sumatran tigers. One of the major benefits of this post was being able to run field courses in interesting places and after a series of natural history courses in Scotland - culminating in 'Otter surveying in the Outer Hebrides' I was able to persuade the Department to let me run a course entitled' Marine mammals In California' - in California. Based on Cannery Row in Monterey we were able to watch sea otters from our hotel and travel to the coast nearby to see elephant seals and sea lions and watch grey whales migrating. Not necessarily as a result of this the University offered me the opportunity to take voluntary redundancy in 1998 and, a few years later, closed the department. This gave me the opportunity to develop the occasional consultancy work I had been undertaking into a full time second career. Today most of my work is with badgers, dormice and otters and increasingly I offer a specialist service where my great experience enables clients to tackle problems which may seem large or even intractable. Other species make for variety, whether it be searching for harvest mouse nests in the Thames basin or devising methods of surveying pine marten and red squirrels for a major road scheme in Ireland. With most mammals enquiries, if I don't know the answer myself, I usually know someone who does. Based in Crediton, near Exeter I travel throughout the UK and Ireland with projects from Cornwall to Glasgow and Donegal to Suffolk. I am always willing to work elsewhere in the world and have done field work in Europe and South America. I joined the Devon Wildlife Trust in 1971 and its Cornish equivalent in 1977. A life member of both I was at various times on their councils, management, scientific, education and conservation committees culminating in chairing the DWT conservation committee in the early 1990s. I am a Trustee of the Whitley Wildlife Conservation Trust which owns Paignton and Newquay Zoos as well as the Slapton Ley National Nature Reserve. At present, I am Chair of the Board of Trustees and a member of the Conservation Education, Research and Awards Subcommittee. I am a member of the British Ecological Society. I also support the World Land Trust, both directly and by donating Public Lending Right payments to them. 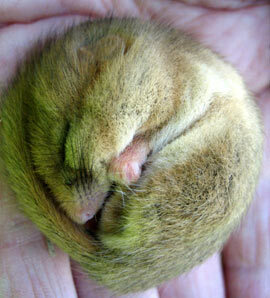 Remember, every time you borrow one of my books from the Library you are helping to buy important, threatened habitats.